This entry was posted in All Mechanics and tagged 566 China short selling on March 9, 2015 . Disclosure: No position in 566 HK. Northbound short selling has been allowed for six trading sessions on the Shanghai-Hong Kong Stock Connect (沪港通) and so far not a single A share has been sold short. It’s not yet possible at Interactive Brokers, so apparently other brokers are also still figuring out the settlement logistics. Hong Kong-listed shares, on the other hand, remain fertile hunting ground for short sale candidates. But seller beware! The influence of Shanghai’s frothy, retail-driven stock market may be beginning to be felt. One line in a WSJ article about the recent unexplained and unjustifiable rise of Hanergy Thin Film (566 HK) caught my eye: “The company’s share price has nearly quadrupled, to HK$6.80 on Friday, since the trading link opened on November 17, making it the best-performing and most widely held stock in the program known as Shanghai-Hong Kong Stock Connect.” To what extent might retail interest have driven such a massive change in the valuation of a loss-making solar panel manufacturer whose accounting and relationship with its parent has long drawn scrutiny from shortsellers? I am reminded of a conversation I had with my uncle in Shanghai earlier this year, a few days after the Shanghai Composite fell nearly 8% in one day. Not to pick on him, but my uncle is the quintessential retail daytrader. He and my aunt have long enjoyed telling family about their occasional speculative stock trades, but as the Chinese A-share market has heated up, they have become more serious about actively trading their savings. My 16-year-old cousin proudly told me about her first real-money three-bagger last fall, which she had picked at random. A sign of the times, perhaps? To his credit, my uncle understands the dangers of trading on margin, unlike much of his competition, and he is quite thoughtful and careful about his position sizing. But like most of his fellow retail traders in China, he is not evaluating stocks on any sort of fundamental basis. He is a momentum trader and a speculator with a long bias, and he knows that eventually what goes up must come down. In my opinion, this sort of non-fundamental trading creates opportunities for fundamental investors with a longer time horizon. Conversely, it can also be a reason why mispricing persists in markets that remain dominated by retail investors. Estimates vary, but Shanghai trading is thought to still be at least 50% retail-driven, with Hong Kong around 30% according to INSEAD. In US markets, it is often clear when an illiquid, low-capitalization security has been pumped by uninformed retail speculators. There is typically a paper trail of newletters or cheerleading posts on message boards. When it comes to Hanergy, I may not be looking in the right places, but I haven’t seen the usual signs of a pump-and-dump in Chinese media. It’s possible that interest may be arising through boiler room-style marketing by brokerage firms, but it seems at least plausible that the simple fact of the recent rise in the share price has created a momentum bubble that feeds on itself. My experience with Chinese retail investors is that they like to buy stocks that have gone up recently. On the surface, it seems improbable for a company with a US$36 billion market capitalization and meaningful float to be influenced by retail volume. However, retail interest—especially through the Stock Connect Program—has contributed a significant amount of the trading volume during the rise. 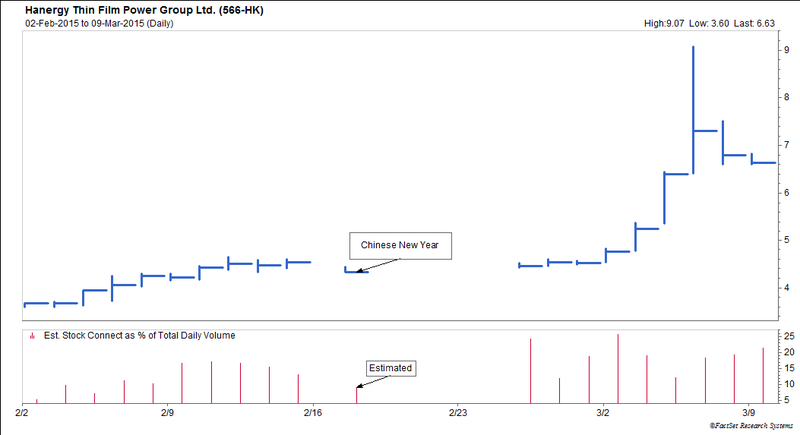 Southbound trade in Hanergy has exceeded 25% of trading volume on some days, and it has represented net purchases (buy volume minus sell volume) every day except one since the beginning of February. The chart below shows the percentage of total trading volume represented by estimated gross Stock Connect volumes as the price has increased. For better or worse, I have been unable to secure a borrow on Hanergy, so this is more of an academic exercise for me. But it is fascinating to witness the formation of a valuation anomaly and speculate as to its cause. Perhaps the bubble will continue as long as mainland retail money continues its net inflow into the stock. The raw daily data below is from FactSet and the HKEX Daily Top 10 Southbound securities, available for trading sessions beginning February 2, 2015. *Estimated from February monthly figure.